Anorexia Nervosa, generally referred to as anorexia is an eating disorder in which a person has an unnaturally low body weight, intense fear of gaining weight and a distorted perception of body weight. Individuals with anorexia put a high value on controlling their weight and shape, applying extreme efforts that tend to impede activities in their lives significantly. To prevent weight gain or extend weight loss, people with anorexia commonly will restrict the amount of food they eat. They may control caloric intake by vomiting after eating or by misusing laxatives. Diet aids, diuretics or enemas. They may try to lose weight by exercising excessively. Some people with anorexia binge and purge, similar to individuals who have bulimia nervous. However, some individuals with anorexia struggle with an abnormally low body weight, while individuals with bulimia typically are normal or above average weight. Regardless of the method of weight loss, the person with anorexia has an intense fear of gaining weight. Anorexia is really about food. Its an unhealthy way to try to cope with emotional problems. When you have anorexia, you often equate thinness with self-worth. Anorexia can be very difficult to overcome. However, with the treatment, you can develop a better understanding of who you are, and develop healthier eating habits as well reverse some of the anorexia’s serious complications. 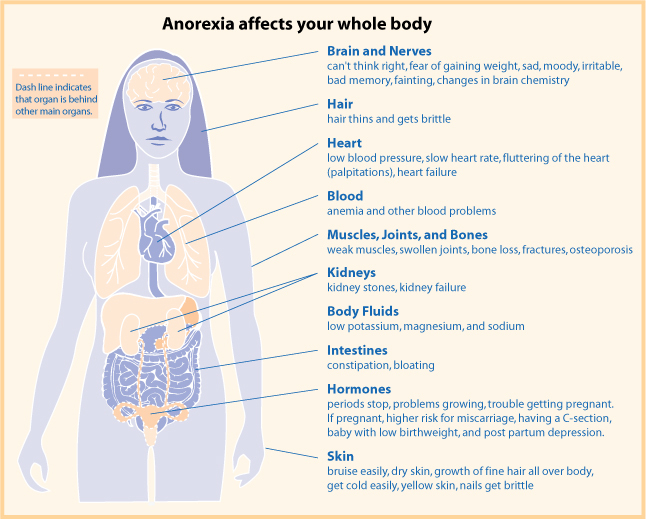 The Physical signs and symptoms of anorexia nervosa are associated with deprivation, but the disorder also involves emotional and behavior issues related to an unrealistic viewpoint of body weight and an extremely strong fear of increasing weight or becoming fat. Soft Downing hair is covering the body. Binging and then self-induced vomiting to get rid of the food and may include the use of laxative, diet aids, enemas, or herbal products. Extreme restriction food intake through dieting or fasting and may include excessive exercise. Anorexia, like other eating disorder, can take over your life. Regrettably, may people with anorexia do not want treatment at leats initially. Their desire to remain thin overrides concern about their health. If you have a loved ones that you are worried about, urge her or him, talk to a doctor. 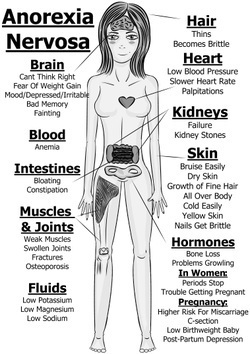 If you are experiencing any of the problems listed above, or if you think you may have an eating disorder get help. If you are hiding anoxia from loved ones, you should try to find a confidant you can talk to about what is going on. It may be hard to notice signs of anoxia because people with anorexia often disguise their things, eating habits or physical problems. If you are concern that a loved one may have anorexia, watch for these red flags. Biological – Although it is a not yet clear with genes are involve, they may be genetic changes that cause some people to become more vulnerable to developing anorexia. Some people may have a genetic tendency toward perfectionism, sensitivity, and perseverance – all traits associated with anorexia. Physiological some emotional characteristic may contribute to anorexia. Young women may have obsessive-compulsive character traits that make it more effortless to stick to strict diets and forgo food despite being hungry. They may have an intense drive for perfectionism, causing them to think they are never thin enough. They may have giggles and anxiety and restrict their eating to reduce it. Environmental . A modern Western culture that emphasizes thinness. Success and worth are often associated how thin you are. Peer pressure may help stoke the desire to be thin particularly among young girls and women. Being female. 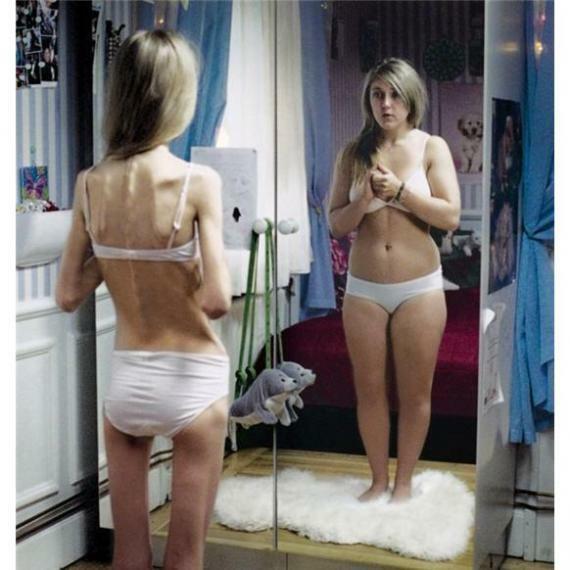 Anorexia is more common women and girls. However boys and men have increasingly have been developing eating disorders. This may be done to growing social pressures. Genetics Changes in particular genes may make people more receptive to anorexia. Family history. Those with a first-degree relative – a parent, sibling or child who have the disease have a much higher risk of anorexia. Weight Changes – When individuals change their weight, on purpose unintentionally those modifications may be strengthened by positive remarks from others for losing weight by negative remarks for regaining weight. Such changes and comments may trigger someone to star dieting to an extra. Also starvation and weight loss may change the way the brain operates in vulnerable individuals, which may perpetuate prohibitive eating behaviors and make it harder to return to normal eating habits. Transitions. Where its a new job, city, home or school, relationship breakup: or even an illness or death of a loved one. Change can cause emotional stress and increase the risk of anorexia. Artistic activities, Sports or work, Athletes, actors, models, dancers are at higher risk of anorexia. Coaches and parents may unconsciously raise the risk by suggesting that young athletes lose weight. Society and Media. The media, such as fashion magazines, TB shows, often feature skinny actors and models. These images may seem to equate being thin with popularity and success. Whether the media just reflects social values or rather just drive them is not for certain. 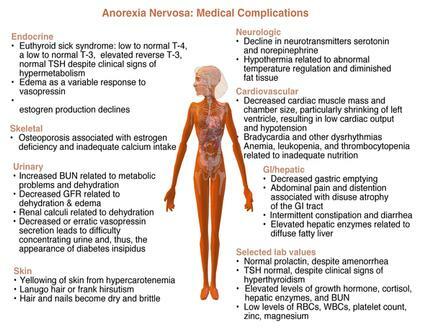 Anorexia nervous can have various complications. In the most severe cases, it can be fatal. Death may occur suddenly – even when someone is not severely underweight. This can be the result of abnormal heart rhythms (Arrhythmias ) or an imbalance of electrolytes – minerals such as sodium, calm and potassium that m ain the balance of fluids in your body. IF a person has anorexia and become extremely malnourished, every organ in the body can become damaged, include the heart, kidneys, and brain. The damage may not be completely reversible even when the anorexia is under control. If your doctor presumes that you have anorexia nervous, he or she will typically run several test and exams to help pinpoint a diagnosis, rule out medical causes for the weight loss, and check for any related complications. Physical exam. This may include measuring your height and weight checking your vital signs, such as heart rate, blood pressure and temperature checking your nails or skin for problems. Listening to your lungs and heart and examine your abdomen. Lab test – These may include a complete blood count (CBC) and more specialized blood test to monitor electrolytes and protein as well as the functioning of your liver, kidney, and thyroid. A Urinalysis also may be done. Psychological evaluation – A doctor or mental health provider will likely ask you about your thoughts, feeling and eating habits. You may also be asked to perform mental self-assessment questionaries. Other studies. X-rays may be taken to check your bone density, check for stress fractures or features. Alternatively, check for pneumonia or heart problems. Electrocardiograms may be arranged to look for heart irregularities. Testing may also be done to ascertain how much energy your body uses, which can be helped in the planning nutritional requirements. The Diagnostic and Statistical Manual of Mental Disorder (DSM-5), published by the American Psychiatric Association, Is used by mental health professionals to diagnose mental conditions and by insurance companies to reimburse for treatment. Restricting food intake- eating less than needed to maintain a body weight that;s at or above the minimum recommended/healthy weight for your age and height. Fear of gaining weight – an intense fear of gaining weight or becoming a fat, or steadfast behavior that interferes with weight gain, such as vomiting or using laxative even though you are underweight. Problems with body image denying the seriousness of having a low body weight, connecting your weight to your self -worth, or having a distorted image of your appearance or shape. When you have Anorexia Nervosa, you may require doing several types of treatment options. Treatment is typically carried out by a team of specialist medical providers, mental health professionals, and dietitians, all with experience in treating eating disorders. Ongoing therapy and nutrition education are critical to continued recovery. Here’s a look at what is commonly involved in treating people with anorexia. If your life is in immediate danger from lack of nourishment from Anorexia, you may require treatment in hospital emergency room from difficulties as heart rhythm disturbance, dehydration, psychiatric problems or electrolyte imbalances. Hospitalization may be needed for medical complications, or psychiatric emergency or continued refusal to eat may require hospitalisation in the psychiatric ward. Some clinics specialize in treating individuals with eating disorders. Some people may offer residential or day programs rather than full hospitalization. Specialized eating disorder programs can offer more intensive therapy over longer periods of time. Because of the host of complications anorexia cases, you may need constant monitoring of vital signs, electrolytes, hydration, and other physical conditions. in severe cases people with anorexia may initially require feeding through a tube that is placed in their noses or goes through to the stomach. The first aim of treatment is going back to a healthy weight. You can recover from an eating disorder without restoring yourself to a healthy weight. A dietitian can offer guidance going back to regular patterns of eating, including providing specific meals plans and calorie requirements that help yo to maintain your weight goal. Your family may also need to get involve in helping you maintain regular eating habits. Family -based therapy – This is only evidence 0based treatment for teenagers with anorexia. Because the teen with anorexia is unable to make good decisions about eating and health while in the clutches of this serious condition, this therapy mobilizes parents to help heir child with refeeding and weight recovery until the child can make good choices about health. There are no medications that are recommended for the treatment of anorexia because none has been found to work very weel. Although antidepressant or other psychiatric medications can help treat, other medications can help treat other mental disorder you may also have, such as depression or anxiety. People with eating disorders can recover. There is heightened the risk of relapse during periods of high stress or during triggering situations. Ongoing therapy or periodic appointment during times of stress may help you stay healthy.